Since the advent of our new baby Red Squirrels back in June last year, head falconer Matt has been working on designs for a new enclosure. With an increased colony size and the possibility of breeding more youngsters this year from unrelated pairs, it’s important that we have the requisite space so that we can manage the family groups appropriately. Red Squirrels are lively, inquisitive creatures and so it’s essential that they are encouraged to develop naturally and have the opportunity to demonstrate the behaviours that they would in the wild. As with the original pen, the new enclosure will be especially high to encourage climbing, with bushes & branches, trees & logs for them to scamper around, much as there would be in a natural woodland environment. Work has already begun and the footings have now been dug, so we’ll keep you posted with how things progress over the next few weeks. Our woodland walk not only houses our Red Squirrels and chipmunks, but also a variety of other wildlife, including the many birds that regularly visit the feeders strategically placed outside the bird hide. This is a good time of year for a tidy up and a bit of TLC, so Andy has been working hard doing just that. Over the last couple of weeks, using the natural wastage that occurs in the woodland, Andy has been creating new ‘hedging’ to adorn parts of the walkway. This serves two purposes (apart from utilising rather than wasting natural resources) as it helps to provide an attractive feature and, more importantly, will help to encourage an even greater diversity of insect wildlife to make our woodland walk its habitat. This in turn will hopefully encourage more birds to visit – perhaps even species we haven’t yet seen here before! 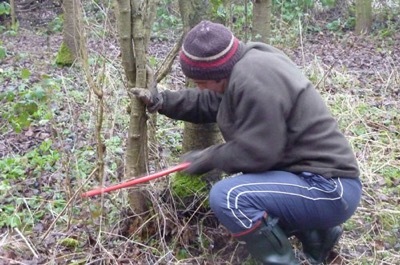 In addition to his hedging exploits, Andy has also been selectively coppicing, which is a traditional method of woodland management. Trees naturally shed unnecessary branches in order to extend their lives, a procedure called ‘retrenchment’. Coppicing mimics this natural process by taking advantage of the fact that many trees make new growth from the stump or roots if cut down. This exercise resets the ageing process and lengthens the life of the tree. There are other benefits too from the careful coppicing of trees, which, as you would expect, provides areas of greater light intensity where other plants are then able to flourish. This in turn opens up greater possibilities in terms of animal biodiversity, as many animals are dependent on plants other than the trees that grow in a woodland. Remember to keep up with our blog for further developments at the Sanctuary and you can also follow us on Facebook and Twitter. Better still, why not come and see for yourself? – we look forward to your visit!